Ships from and sold by Sunnyshine trade. Are you worried about babys kicking off their blanket at night and catch cold? 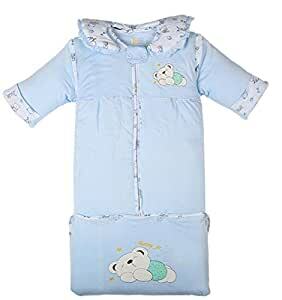 Are you wondering which sleep bag to use and whether your baby will be too hot or cold while sleeping? Fairy Baby Toddler Sleeping Bag is the solution to all your problems! -The material is thick enough for winter and fall. -There are 2 different sleeve types to choose, you can choose to remove the sleeves if it gets too warm for your little one. -There are zipper-pull guards on the neck and bottom to protect child's skin. Also the feet cover can extend the length when your kids grow bigger. -Sack Bottom Zipper design,easy for the mother changing diapers; Removable sleeve design,free dress,a coat of dual use. -At the bottom of the sleeping bag can be completed opened; With removable long sleeve,Removable cap,Hem fixed buttons.Sleeping bag size can easily adjust.